Centara Hotels & Resorts has signed a management contract for an existing resort hotel on Koh Samui to operate under the “Centra” – the group’s value brand. The property, located on Thong Tanote Beach and originally known as Coconut Villa Resort & Spa, has been named Centra Coconut Beach Resort Samui. The resort has 55 guestrooms, with one all-day dining restaurant and two swimming pools. It is located directly on a secluded beach on the south side of the island, with views across Koh Tan and Koh Mutsum, both of which are renowned diving and snorkeling spots. “We are delighted to add this beautiful beachfront property to our Samui portfolio and thereby extend our Centra value brand to one of Thailand’s most popular tourism destinations,” says Thirayuth Chirathivat, chief executive officer of Centara Hotels & Resorts. 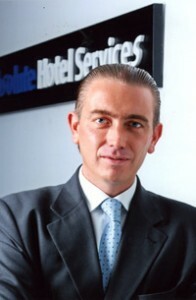 “This is an intimately scaled hotel and fits into the brand.” The group now has three of its hotel brands on the island. Bangkok – Global professionals and experts in spa management and the health and wellness sector will be meeting in Bangkok for the “World Spa & Well-being Convention” between Sept. 19 and 21. Some 3,000 trade-visitors are expected to attend the exhibition. The gathering is expected to give another boost to the spa, health and wellness sector, one of the fastest growing niche-market segments of the Thai travel and tourism industry. The Thai Spa Association, with sponsorship support from the Tourism Authority of Thailand and the Thailand Exhibition and Convention Bureau, is organizing the event. The health and wellness sectors attract millions of visitors annually. Last available research shows that in 2010 alone, an estimated 1.4 million medical tourists visited Thailand, up from 500,000 in 2001. The brand has launched “Friends of Four Points” globally on July 16. During the three-month promotion, from mid-July through end of September, all guests checking in at any of more than 160 Four Points Hotels around the world on Mondays through Thursdays will receive a Friends of Four Points “token” for a free perk. At Four Points Sukhumvit 15, tokens will be valid for specialty coffee. Guests can redeem their token during their current stay or during a future stay at any Four Points location globally. Tokens can be redeemed until Dec. 31. As an added celebration, all Four Points hotels also hosted a “worldwide wake-up call.” At Four Points Sukhumvit 15, guests enjoyed traditional Thai iced tea as well as a coffee frappe, the perfect refresher for the summer weather in Thailand. Chiang Mai – Two hotels under the U Hotels & Resorts brand in Thailand – U Chiang Mai and U Kanchanaburi – have received Trip Advisor’s “Certificate of Excellence” awards, which honors top-rated accommodation, businesses, restaurants, and tourist attractions worldwide. The U brand was created with today’s travelers in mind and their expectation from the fast moving pace of the hospitality industry. Hua Hin – Hyatt Regency Hua Hin recently received recognition as one of the world’s best coastal resorts from CNNGo. The resort hosts The Barai, an award-winning destination spa, enabling it to provide world-class spa journey to its guests. The resort also has three interconnecting pools: the river pool, lagoon pool, and children’s beach pool with a not-to-be missed 22m-long waterside. The resort has the longest beachfront in Hua Hin, giving guests an opportunity to enjoy a leisurely walk along the beach in the early morning or during sunset. Another element considered by the judges was the recreational activities. 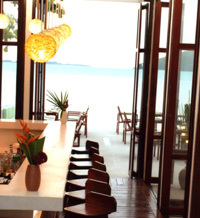 The resort offers a range of activities including many that introduces guests to Thai culture and lifestyle. Hua Hin – Arporn Hemmara, director of human resources, recently received the “2012 Drug Free Workplace Project” award on behalf of Sheraton Hua Hin Resort & Spa from Prasarn Wongsawad, deputy governor of Petchburi province, during ceremonies held at the Petchaburi Town Hall recently. The award recognizes the resort as an outstanding service provider facility in preventing the use of drugs in the work place and solving drugs-related problems. 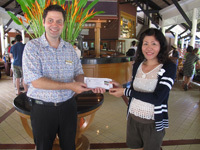 Cape Panwa Hotel Phuket Resident Manager Phillip S. Frickhinger presents a ‘Four Night Free Stay Gift Voucher’ to Kannikar Threepalaviseskul, first prize winner of a special raffle at the resort recently. The raffle was held during the recent “Cape Panwa Hotel Phuket Raceweek 2012,” proceeds of which will go to the Thai Society for The Prevention of Cruelty to Animals. Bangkok – The Tourism Authority of Thailand (TAT) is an official sponsor of the 13th annual “World Gourmet Festival,” organized by the Four Seasons Hotel Bangkok, set to take place at the hotel Sept. 3-9. The event features an extraordinary line-up of some of the world’s best chefs, winemakers and food experts, who come together under one roof for a weeklong celebration of outstanding food and superb wines. Mode Sathorn Hotel Managed by Siam@Siam, which will officially open later this year, has announced its pre-opening team. The team is led by Pinit Krisanavanit, general manager; Roland Aung, executive assistant manager; and Naksith Kasempiriyaphong, human resources director. The team recently welcomed the first members of what is billed as the the first “Fashionable Lifestyle” hotel in Thailand.